Over the past four years, Arts Visalia has featured quilt and fabric art in exhibitions including the Women in Harmony show in 2006 and the California Fiber Artists show in 2009. These exhibitions showcased artists from throughout California and made a case for the growing interest among artists for the quilt as a something other that simply a utilitarian object. In our latest exhibition, featuring the Sew Eclectic Quilt Artists, we hope to draw attention to the high quality of quilt art being produced by artists right here in our local area. The Sew Eclectic Quilt Artists are a regionally-based group of artists who have joined together in order to exhibit and promote their work. 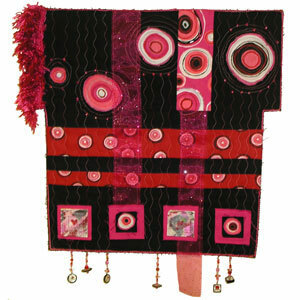 As their name implies, they are a diverse group in their artistic expression, yet they are connected through one common thread: the love for quilting and the creative opportunities afforded the artist through the versitile nature of fabric. Commonly thought of in its traditional form, artists today push the boundaries of quilting as they explore the tactile and technical possibilites of a medium that is now known in the art world as the fiber arts. Today’s quilt artists employ hand-stitching and machine-stitching methods, hand-dyed and commercially available fabrics, and even digital image transfers in the development of their artworks. Even the shapes of the quilts themselves are game for creative exploration for today’s quilt artist.